On the rapidly gentrifying East River shoreline of Brooklyn, the border between the neighborhoods of Greenpoint and Williamsburg begins at Bushwick Inlet. Formerly used as an oil storage dock, this indentation in the shoreline is in the process of being transformed into Brooklyn’s newest park. The inlet is a remnant of Bushwick Creek, which reached further inland prior to urbanization. After a struggle to acquire properties along its shores, the entirety of Bushwick Inlet is now assigned to the Parks Department as it prepares to transform the vacant space into a park. The stream originated in two sources, one to the south of McCarren Park and another within the site of the park. The branches merged and widened into a salt marsh that widened towards the East River. The marsh had an island in its middle. The map above, originally made by North Brooklyn History Blog shows the course of Bushwick Creek on today’s street grid. I modified the map to show the present borders of Bushwick Inlet Park, a work in progress. Prior to urbanization, the inlet was a wide cove that was reduced in the 19th century through land reclamation. As neighborhoods expand towards each other, their street grids collide. On this map, the named streets of Greenpoint and the numbered streets of Williamsburg are separated by McCarren Park, a salt marsh that avoided development. Filled in at the turn of the 20th century, it was designated a park in 1905. Settled during the Dutch rule of the region, Bushwick is the anglicized name of the Dutch name Boswijck, meaning “little town in the woods” or “heavy woods.” Land for the town was acquired from the native Lenape residents in 1638, with Dirck Volkertsen de Noorman and his wife Christina Vigne setting up the first farm in 1645. The couple exemplified the diverse immigrant population of New Netherlands as the husband was Norwegian and his wife was Walloon. As the neighborhood’s name suggests, the “Norseman” settled here to harvest timber for the colony. The stream that ran through the farm was informally known as Noorman’s Kil in its early years before the town of Bushwick lent its name to it. The original name can still be found on the map at Noorman’s Kil, a historically-themed tavern located at 609 Grand Street. Norman Street in Greenpoint also commemorates the pioneer settler. In contrast to the fortified colonial capital in lower Manhattan, the outlying farms were subject to native reprisals that limited the extent of Dutch settlements on Long Island. In the attacks, Volkertsen lost three of his sons-in-law. His farm is believed to have stood on the northern shore of Bushwick Creek, at the present-day corner of Franklin and Calyer streets. The East River shoreline of Greenpoint and Williamsburgh was known in colonial times as The Strand, an antiquated term for beach where Brooklyn farmers transported their produce to the markets of Manhattan. Towards the middle of the 19th century, industries were established along Bushwick Creek, including the Astral Oil Works. Established by Charles Pratt in 1857, the tanks site remained in use into the early 21st century, when it was rezoned for parkland. A prominent name on the Brooklyn landscape, the oil millionaire founded Pratt Institute, an art, architecture and engineering college located in the Clinton Hill neighborhood. Closer to Bushwick Creek, Pratt financed the Astral Apartments, located at 184 Franklin Street, a historic apartment building built for the workers of Astral Oil Works. Astral was acquired by John D. Rockefeller’s Standard Oil monopoly in 1874, eventually passing down to Bayside Fuel Oil until 2008, when the site was purchased by the city for Bushwick Inlet Park. In Civil War history, Bushwick Creek was the launch site of the USS Monitor, the first ironclad warship in the United States, which was constructed in 101 days in 1862 at the Continental Iron Works on the inlet’s north side. The construction of the vessel took place in the midst of an arms race against the Confederate navy, which retrofitted the former USS Merrimack into the ironclad CSS Virginia, threatening the northern blockade effort. Shipbuilding at Bushwick Inlet ceased by 1889 but on the local landscape there are three reminders of the legendary vessel: Monitor Street in Greenpoint and a monument to the ship in McGoldrick Park. Its inventor John Ericsson was honored with a monument in Manhattan’s Battery Park and the co-naming of Junior High School 126 in Greenpoint. In 1839, Kent Avenue was extended over the creek and wetlands to the east of this bridge were filled in the following decades. On the left, the Nov. 2, 1913 Brooklyn Daily Eagle provided a history of the creek as it was being filled. In 1905, the city acquired 42 acres of filled marshland to the east of Kent Street for Greenpoint Park, which was renamed and developed as McCarren Park in 1909. Its namesake is State Senator Patrick McCarren, who lived in Brooklyn and died in 1909. 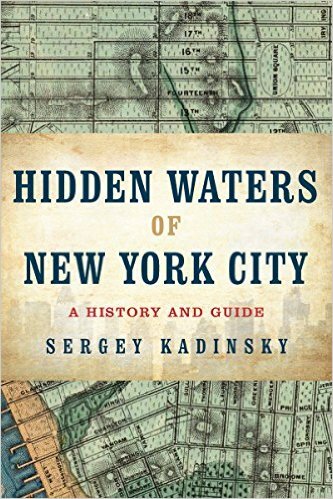 Throughout its history, Bushwick Inlet has seen its share of sensational stories related to its use as a dock. On September 26, 1893, the New York Times reported on a herd of dehydrated Texas steer bound for a Williamsburg slaughterhouse spilled across the railing at Kent Street into the “ooze and mud of Bushwick Creek where their frantic struggles only mired them the deeper.” The timing was fortunate as the tide was going out, sparing the steer from death by drowning. The animals’ handlers fed them fresh water in buckets and extricated them from the mud. In all likelihood, the steer probably ended up becoming someone’s dinner as intended. In recent times, when livestock escape their date with the butcher, society tends to be more sympathetic by sending the lucky creature to a farm or petting zoo. During the Prohibition, the coves and inlets of New York served the rumrunners who delivered their cargo under the cover of night to eager consumers. On August 16, 1924, the police impounded bootlegger tugboat Lorraine Rita at Bushwick Creek. The tug was described by authorities as “one of the most annoying rum runners entering the harbor.” It carried a cargo of champagne, scotch and rye whisky estimated at $230,000. Previously known as the Albatross, the ship was destined for the scrapyard but somehow ended up in the hands of smugglers. The decline of manufacturing along Brooklyn’s waterfront resulted in a wholesale rezoning from industrial to residential, ushering in massive glass and steel condo towers such as Schaefer’s Landing, Northside Piers, and The Edge. Longtime residents protested the lack of open space on the waterfront in a borough where many homes were too far a walk from the closest park. The first success was in 2005, when a portion of the waterfront was zoned for parkland. The former Brooklyn Eastern District Terminal was purchased by Trust for Public Land and passed to the state in 2001, which developed the two-block parcel as East River State Park . The rail freight terminal on this site closed in 1983 and its tracks were pulled out of the ground. At the same time, the building foundations and cobblestones in the park testify to its past. The park is located on Kent Avenue, four blocks to the south of Bushwick Inlet. My specialty, historical signs appear prominently in the park, describing its history. If it were up me, every city and state park would come with an identical brochure and signs explaining their history with photos and maps, similarly to how the National Parks Service has its trademark brochures for every NPS site in the nation. At this time, only a small portion of city parks have official brochures, and State Park brochures could use a graphic design overhaul. If it were up to me, my ideal job would be drafting the text for park signs and brochures across the city and state with my wife as the graphic designer. I would also train park rangers and tour guides on telling the stories of parks. Looking to the south we see the massive luxury towers that resulted from the 2005 rezoning of the waterfront with the Williamsburg Bridge in the background. A small bunker structure with a circular window in front of the towers is the ventilation shaft for the 14th Street subway tunnel that carries the L train from Manhattan to Canarsie. looking north, we see the shoreline restored to a naturalistic appearance with a beach. Riprap on the water’s edge serves to mitigate erosion from tides and storm surges. The tower under construction on the horizon is part of Queens West, a section of Long Island City that has its own cluster of luxury condo towers. On the right is the Citi Storage warehouse, which was acquired by the city in November 2016 for $160 million as the final parcel for Bushwick Inlet Park. Its owner Norm Brodsky initially asked for $325 million, threatening to sell his warehouse to condo developers. Fortunately, there was patience, tenacity, an agreement and in the end, the warehouse parcel will be added to the park. On the border of East River State Park and the city-owned Bushwick Inlet Park is an abandoned light beacon. I wouldn’t call it a lighthouse but I certainly hope that it will be preserved in the park’s design, with its graffiti and rust. The post-industrial shoreline is reminiscent of Manhattan’s High Line before it became a park. In its transformation into a park, the High Line lost its rough appearance and became a clean planted walkway. True urban explorers miss its pre-park qualities. Looking at the park’s Master Plan, the former Citi Storage site will be developed as a dog run, youth athletic field, volleyball courts, wetland, and play area. A former sanitation garage next to it will become the central lawn. On the shore of Bushwick Inlet, the former Astral Oil Works will be transformed into planted terraces and gardens. At this time, the south side of Bushwick Creek still has the Bayside Fuel Oil depot’s tanks and their future is the subject of a public debate. Before 2001, two miles to the east stood the Maspeth Holders, the world’s tallest gas tanks. Rendered obsolete, the twin tanks were imploded on April 15, 2001. Watching them disappear inspired some people to ask whether they could have been repurposed for other uses, preserving their familiar place on the skyline. That’s what the supporters of the Maker Park proposal have in mind of the tanks at Bushwick Inlet. According to Architects Newspaper, a team of three local designers: Zac Waldman, Karen Zabarsky and Stacey Anderson, together with Studio V Architecture and Ken Smith Workshop, seek to repurpose the tanks as gardens, performance spaces and reflecting pools. 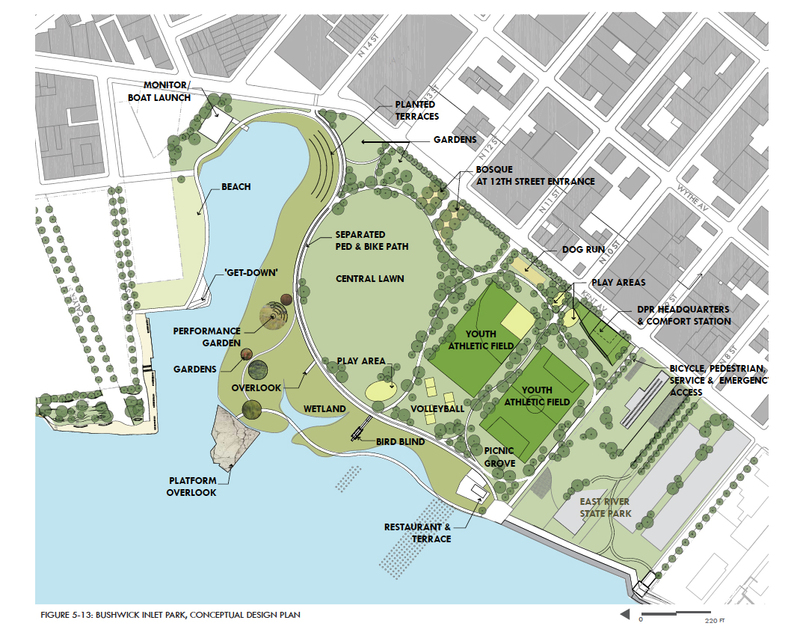 An older advocacy group, Friends of Bushwick Inlet Park, feel that Maker Park is a newcomer intruding on its proposal for open space by the inlet. The debate between preserving industrial structures and maximizing on open space is reminiscent of the recently completed Barangaroo Reserve in Sydney, Australia. In that case, a decommissioned seaport was transformed into a verdant landscape resemblnig conditions from 200 years ago, a park with an indigenous name that honors the first residents of the site. The alternative to the park would have been a neighborhood of waterfront towers with less parkland. On the opposite side of Bushwick Inlet from the Bayside Fuel Oil tanks is a one-acre patch of land owned by the Greenpoint Monitor Museum. A grassroots initiative led by local resident George J. Weinmann, and his wife, Janice Lauletta-Weinmann. For now, the state-chartered museum offers traveling exhibits as its site awaits constrution. Mr. Weinmann is a descendant of a Monitor crew member. In December 2015, the couple received a nearly $600,000 infusion from pollution cleanup funding on nearby Newtown Creek to begin building the museum. It would be the third place in the country commemorating the gunship. There is a Monitor museum in Newport News, Va., and an underwater marine preserve off the coast of North Carolina, where it sank on New Year’s Eve in 1862. In partnership with the National Oceanic and Atmospheric Administration, the museum site already had a flagpole and historic marker sign installed in March 2015. Lacking security, the above sign was stolen a few months later. With funding in place, the museum commissioned the architecture firm AECOM to design its grounds, which would fit into the expanded Bushwick Inlet Park. The park is part of a series of parks along north Brooklyn’s waterfront that includes Grand Ferry Park, Newtown Barge Playground, and WNYC Transmitter Park. In the 1886 Elisha Robinson Atlas, there is still plenty of open space on the site of Bushwick Creek, a salt marsh separating Williamsburg from Greenpoint. In the 1916 Belcher-Hyde Atlas, there are plenty of oil tanks on the map as the inlet’s manufacturing period is at its height. Two blocks inland, McCarren Park preserves the open space where the creek flowed. It will receive its humongous outdoor pool in 1936. In the 1924 NYCity Map aerial survey of northern Brooklyn, the inlet is packed with barges. To its south is a rail yard and around it are oil tanks. The waterfront is inaccessible to the public, which only has MCarren Park as its source of open space. The city’s Greenpoint-Williamsburg Waterfront Open Space Master Plan seeks to reverse this century-old policy by reconnecting the public with the shoreline. Along with Brooklyn Bridge Park, it is the largest park expansion project in the borough in nearly a century. New York Times reports on the city’s plans to build along the Harlem River in the south Bronx. The Journal News reports on a $4.5 million grant from the state to uncover additional portions of the Saw Mill River in Yonkers. San Luis Obispo Tribune reports on a winery’s contribution towards the restoration of Adelaida Creek in Paso Robles, California. Curbed reports on new parks being constructed along Waller Creek in San Antonio, Texas.